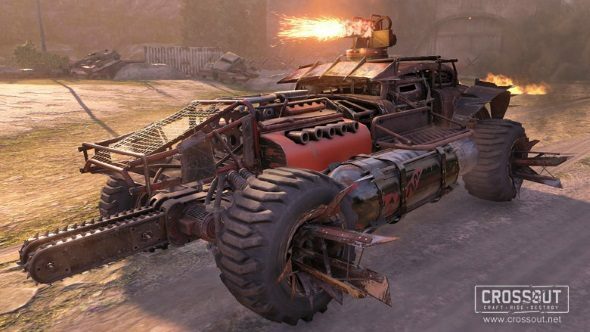 Online vehicular construction and combat game Crossout has been a quiet success over the past few months, building upon a foundation set by developers Targem Games way back in 2005 with the Hard Truck: Apocalypse series. Part of this success is regular expansion-scale updates, the next of which will revolve around a pyromaniac cult called the Firstarters. While not fully implemented in the game yet as a joinable faction, some of their more iconic tech and gadgets can be earned early through an event currently live on the main servers. The anarchic Crossout made our Best Free MMO list. Don’t limit yourself to juse one genre, though – try out a few more of our choice picks. I can’t help but feel that, more than any existing faction, the Firestarters are a bit of a nod towards Avalanche’s semi-recent Mad Max game, and their sect of fire-worshipers, headed up by the brilliantly named Deep Friah. I say this because the single most iconic piece of gear that the Firestarters have to offer isn’t some incendiary weapon, but one of Max’s favored tools from the game; a harpoon gun, capable of wrenching chunks off cars, or just dragging a vehicle off course. Sneaky players can use the harpoon in other, more subtle ways though, including mooring the hook in solid ground, allowing you to lower yourself off bridges for a surprise spider-car attack, or just drop yourself to the ground safely. When you’re playing with that kind of flexibility, firey weapons kinda pale by comparison. The other gear you can get from the Firestarters early is worth a look, though. The Shiv wheels (available both in vanilla and steering variants) have their hubs covered in assorted pointy, spiky things, making them good side-swiping tools capable of tearing off a tire or two. There’s also the Junkbow shotguns, which are pretty spectacular when they fire, sending out a sense spray of glowing metal fragments.Kinda looks like the flak cannon from Unreal Tournament in action, which means it’ll undoubtedly be very satisfying to fire. There are a couple chassis pieces as well, although nothing quite as thrilling. Crossout is free to play, and can be found on its own site here, or via Steam. The Firestarters preview event will be running until the faction fully launches, although no firm date for that is quite set yet.